she decided to hire me to finish the decorating. She liked what I did for her friend, Jeanne HERE and HERE. The tan sofas were in good shape. book shelves and library sconce lighting. But I hope she does now! to break in the room). We also purchased a larger scaled tray coffee table. and added and a bit of gold rub on. I like how it ties in with the other black that we added. This is an after photo but basically, on my last visit, Lisa had all of her accessories on the dining table before I arrived. Which makes shopping with what she already owns much easier. She wanted the shelves “airy” and I like that too. I don’t have a before photo of this wall. here and the trunk was added. we switched them for shells. Which bookends do you prefer? Google Reader ends on July 1. However, you can continue to follow me with Bloglovin. Love the built ins, great job! The built-in was a great idea! Changes the feel of the whole space. Great touch! you worked your magic and it really looks great. I like the neutral bookends. Love the console and mirror vignette. Have a great weekend. It all looks gorgeous love the colors and how soothing and inviting it is. Great lumbar pillow..the shells get my vote! 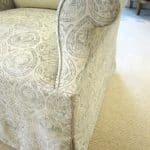 Once again, you've put your special touch on a nice room and made it great! I love the new bookshelves with the sconces, it adds so much warmth to the room. 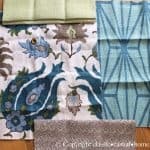 The large lumbar pillow in that beautiful fabric is wonderful and her collection of blue and white porcelain is such a pretty focal point. 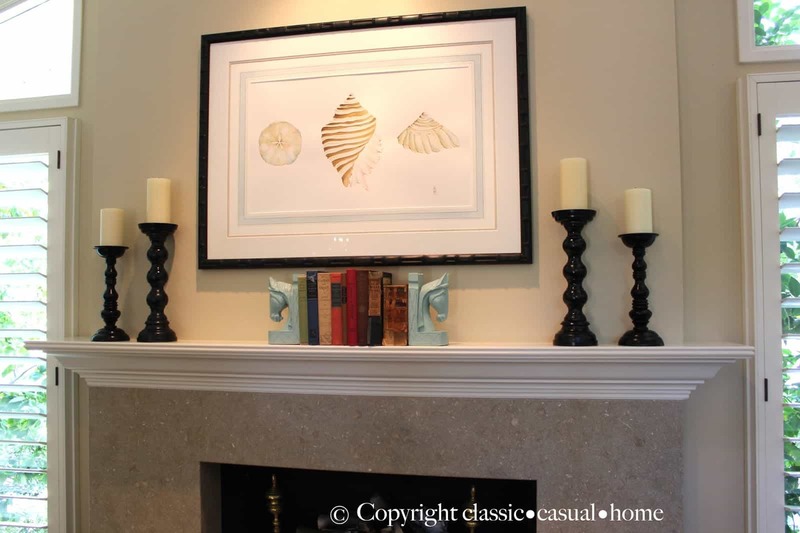 I like the shells on the mantle, but I do like the way the blue bookends brought out the blue in the new matting. Hope you can find another place for them in the room! Can't wait to see her family room redo. The living room is gorgeous! 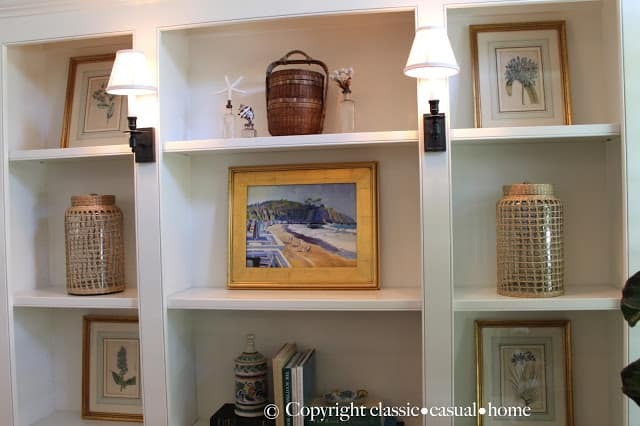 I love the bookcase with the lighted sconces!!! Plus, they were styled to perfection. I know your client was over the moon! Very pretty, love the shells! Mary Ann ~ you've done it again! The room is beautiful. I really LOVE the pillow. I also like all the black accents — the frame and the end table. My vote is for the shells for bookends. I love the splurge purchase, it shows as a splurge! I noticed the sconces on the built in. Love them. In fact the entire room looks great. Looking forward to seeing more in the future. A lovely room to begin with, but what a difference to add the built-ins and the accessories! Lovely, MaryAnn! To answer your question about the book ends, I definitely prefer the shells! They are lovely and tie in beautifully with the print above. Also adore those lumbar pillows!! Perfect as always Mary Ann. Now come to my house please :). 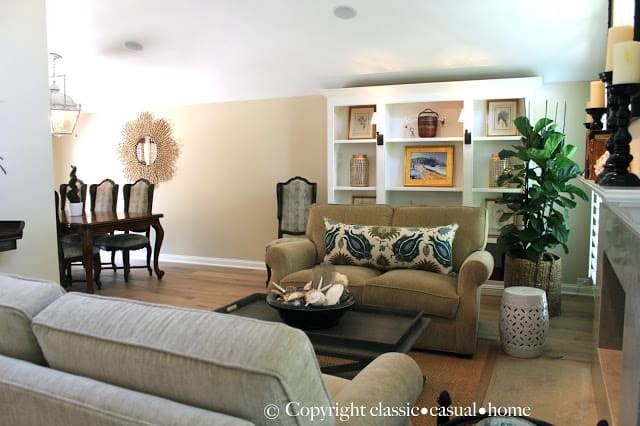 Love this room….you did a terrific job! I like the shells as the bookends. Something blue and white would look nice as well to tie in with the altar table. Love the splurge purchase in the pillows – makes the sofas so much more interesting. So beautiful Mary Ann, you were able to take a nice room and raise it up to fantastic. I am also going to guess that it totally reflects your client so kudos! 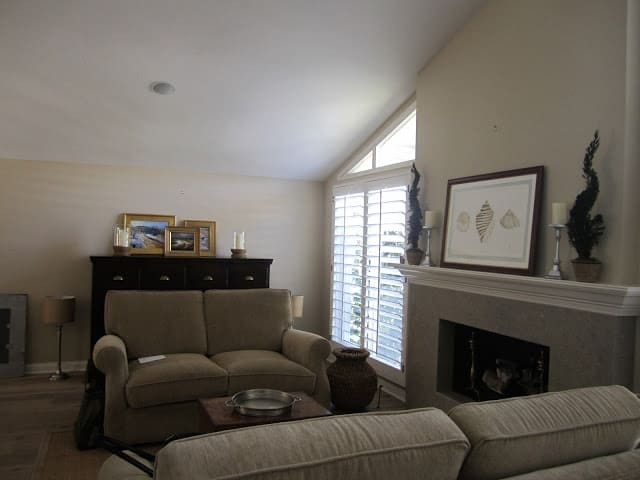 The built-ins with the sconces are awesome! Did you have those custom made? I'd love to know more about them. Yes, they were made by Adrian Schroeder. 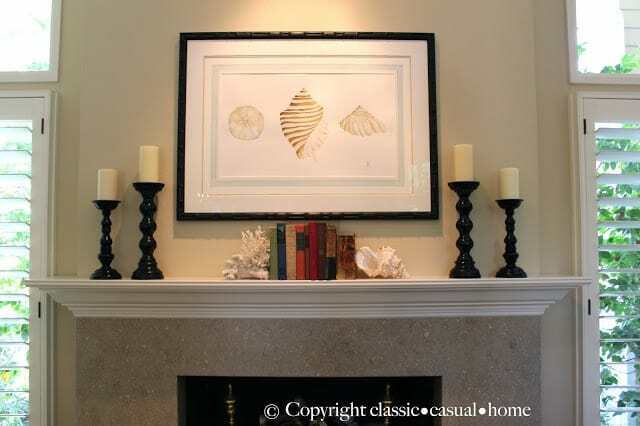 LOVE the shell bookends! Beautiful transformation! I know I would certainly be spending more time in there if it was my room! Those bookshelves have me thinking of where I could put them in my space. Such an impact! lOVE the shell book ends – the organic, casual feeling they give is perfect. The room is beautful! I love how the horse bookends tied in the blue color, but I think I like the shells even better. I would have never thought to use shells as bookends and they have a more casual, relaxed vibe. Now I want to go shop my house and look for some large shells to uses as bookends! Thank you for an inspiring post! The entire room is beautiful!! Love it! You have such great style. I love how well you always find a way to elevate what the homeowner already has. My vote is for the shells. Question: I spy a very intriguing lantern over the dining table. Can you share the deets? 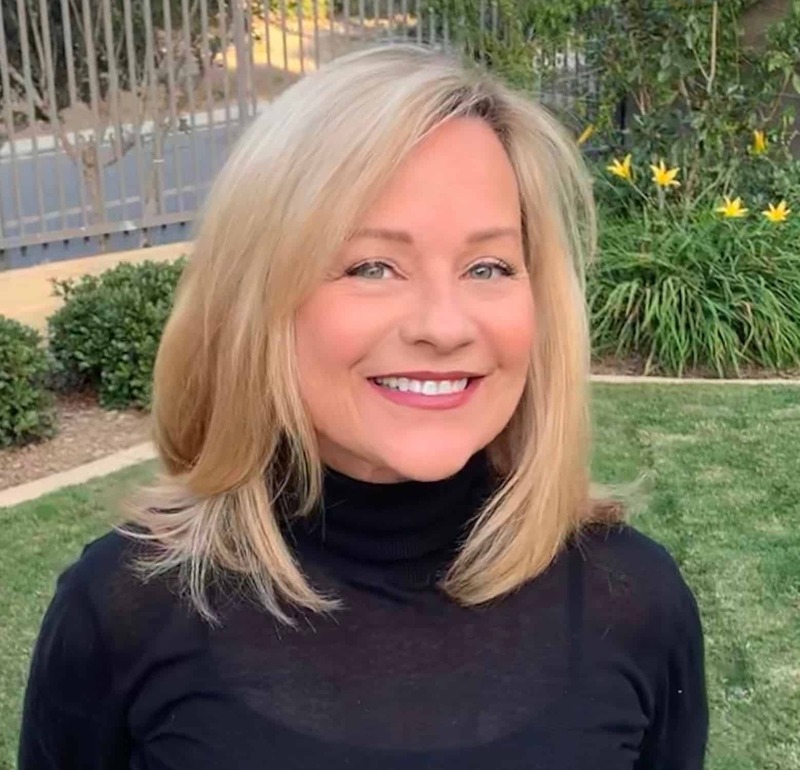 Best, Beth C.
Lisa got the lantern at Dana Creath Lighting in Newport Beach, Ca…not sure of the manufacturer. Love the shells and great idea on the built ins. That room looks beautiful! I love how the room turned out, the bookcase added so much character to the space. Great job as always! You are an amazing decorator. I prefer the shells but I DO like the horses…just wish they were a different color…mabye dark brown or a creamy white? Not sure what they are made of or how valuable they are as is..maybe spray paint or gold rub would ruin them? Everything is so clean and fresh. The bookcase with the lighting made such a difference in the room. Like I said…you are amazing. Beautiful Mary Ann! 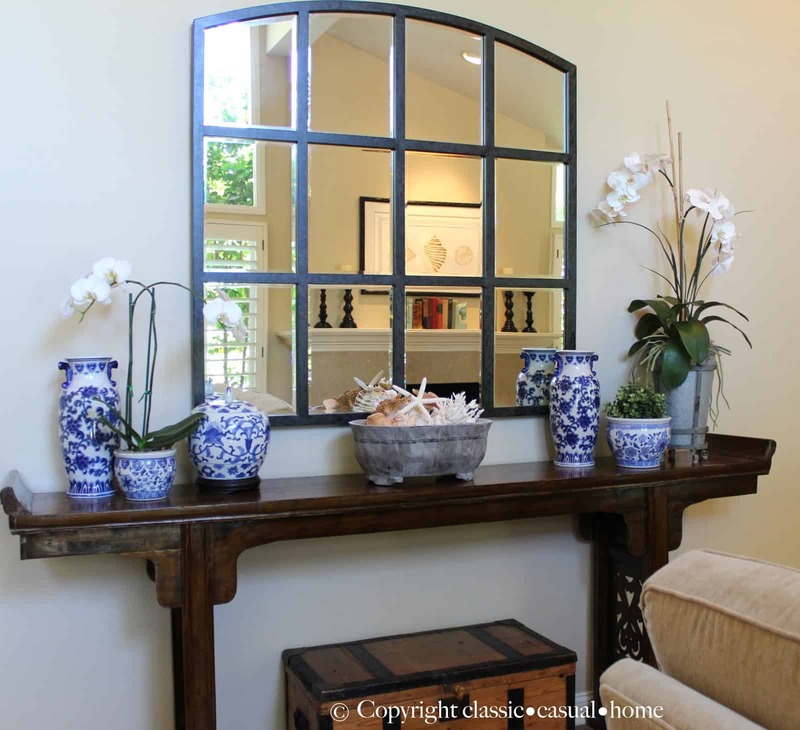 Love the simple, chic styling of the shelves and the blue and white touches. As always, you have the golden touch Mary Ann! 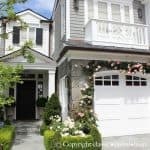 This home looks fantastic with all of your changes. Love the color of the floors too. Gorgeous, as usual 🙂 I am so in love with the pillow fabric. I have a pillow from that collection in my living room. The bookcase is such a pretty backdrop, and the sconces are perfection. So beautiful! The built-ins and the sconces make all the difference. Beautiful, Mary Ann! 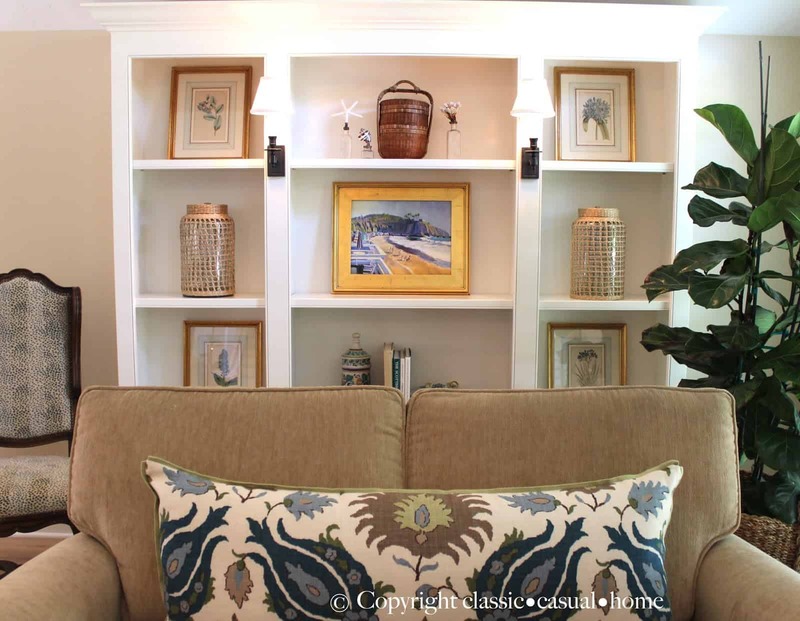 Love the bookcases and the pretty pillow fabric. Another beautiful room makeover! Every little detail is just perfect! LOVE the bookcase and the new coffee table. Any chance you know where she got it?? 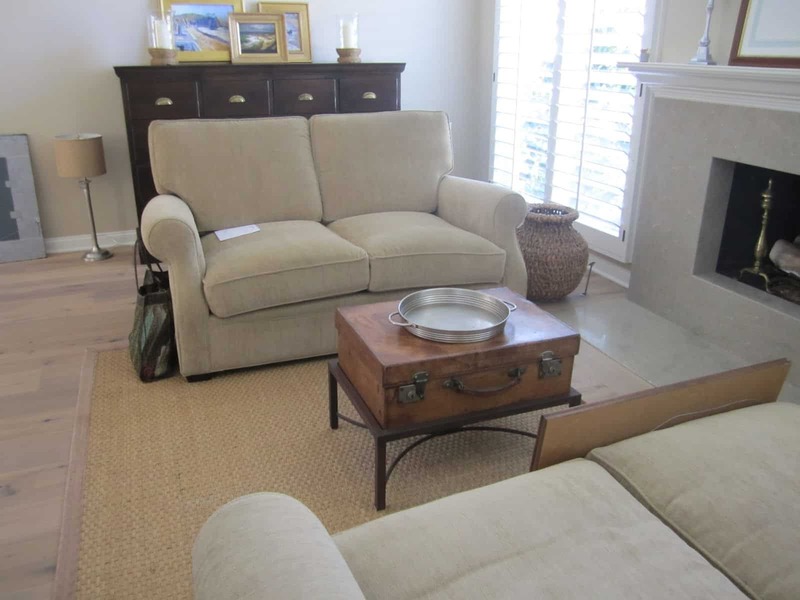 We got the coffee table from Wisteria…but recently, I noticed that Dovetail carries it. 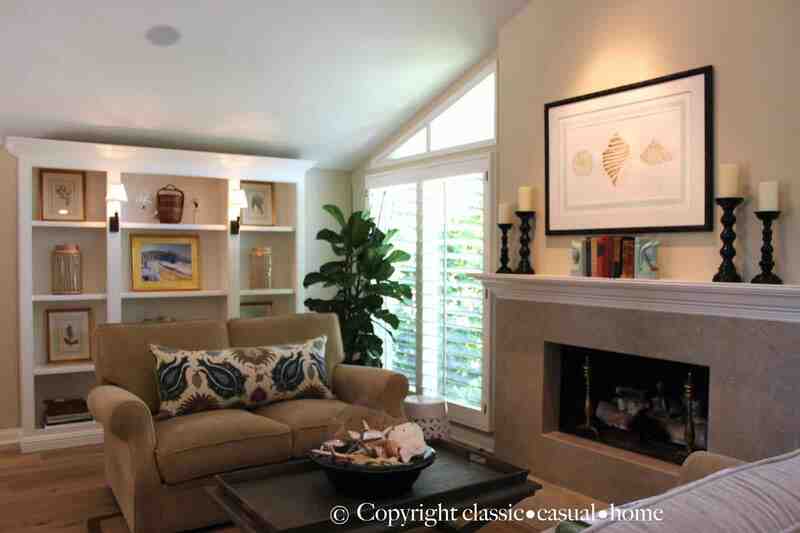 What a transformation – everything looks wonderful, that bookshelf is such an asset. 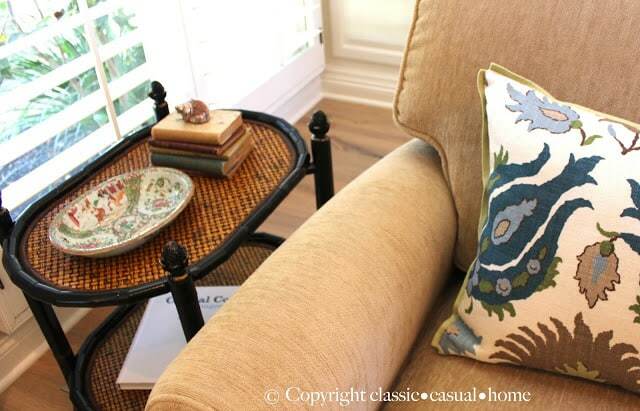 Beautiful choice of cushion fabric. I like the shell bookends. Love what you did! I like the shells as book ends! Definitely the shells. I had never thought of using them as bookends. They are perfect under the watercolor. As always, thanks for sharing. I like the shells for sure. 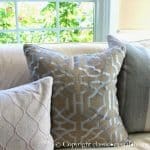 Love the large scale pillows too– they make the sofa! Such a pretty room… congrats and what a lucky friend! This looks great! The changes give the room such an airy feel & richness. Love it. I'm looking forward to see what you do with the family room. Another fabulous transformation, Mary Ann! 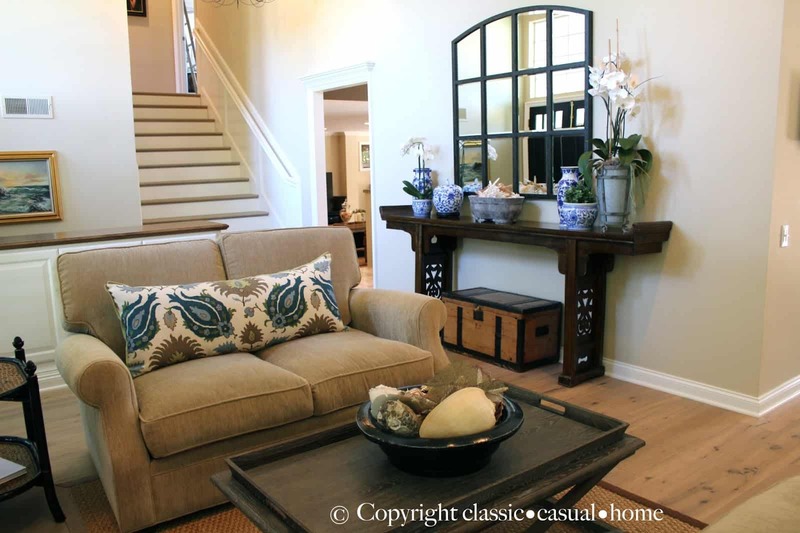 Looks amazing, and I LOVE the sconces on the shelves and the pillow! Oh, beautiful! 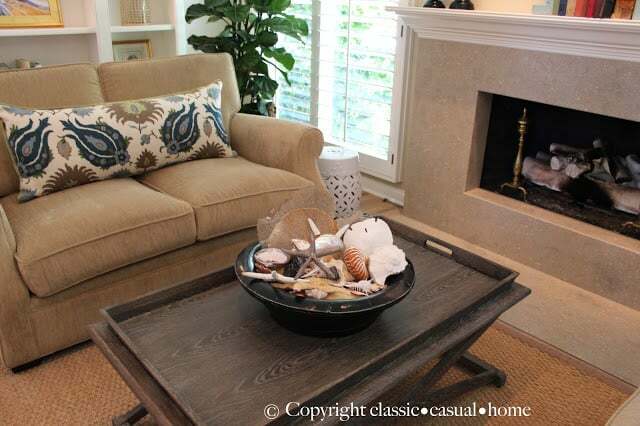 Definitely the shells and I love the lumbar pillows! Thank you for joining Home Sweet Home!